What is the Rational Parliament? We test whether we can argue about policies better if we balance science and research alongside morals and values. 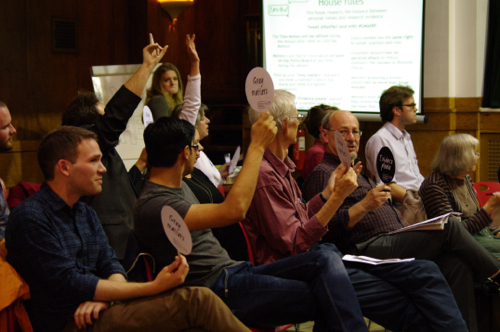 We’re a parallel parliament sitting at Conway Hall in central London. We have our own set of house rules and a kind-of manifesto for how we’d like see debate run. You can debate with us in person, on Twitter @RatParl or on Facebook. Do you think politicians should listen as much to scientists as they do to campaign groups? Come and join in then! Do you think scientists are too distant to get to the nub of an issue? You should come too! Interested?